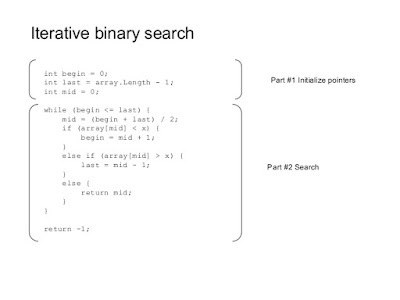 This week’s task is to implement a binary search in Java, you need to write both iterative and recursive binary search algorithm. 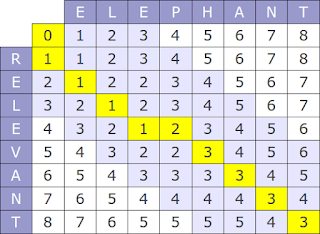 In computer science, a binary search or half-interval search is a divide and conquer algorithm which locates the position of an item in a sorted array. Binary search works by comparing an input value to the middle element of the array. The comparison determines whether the element equals the input, less than the input or greater. When the element being compared to equals the input the search stops and typically returns the position of the element. If the element is not equal to the input then a comparison is made to determine whether the input is less than or greater than the element. Depending on which it is the algorithm then starts over but only searching the top or a bottom subset of the array's elements. If the input is not located within the array the algorithm will usually output a unique value indicating this. 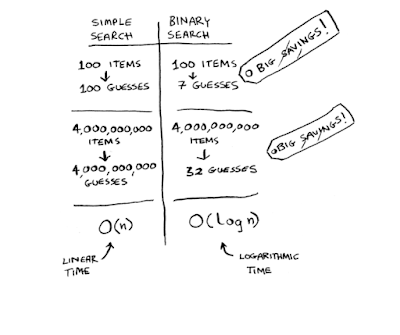 Binary search algorithms typically halve the number of items to check with each successive iteration, thus locating the given item (or determining its absence) in logarithmic time. A binary search is a divide and conquers search algorithm. It works by dividing the input set into half and then applying the algorithm and repeating the same steps until work is done. Btw, if you are not familiar with fundamental search and sort algorithms, then you can also join a course like Data Structures and Algorithms: Deep Dive Using Java to learn fundamental algorithms. Btw, if you prefer books, I suggest you read a comprehensive algorithm book like Grokking Algorithms by Aditya Bhargava, where he has compared liner search with binary search and how their performance and Big O time is compared. It's one of the easiest books on Data Structure and Algorithms and I highly recommend this to all programmers. It's also very visual and full of the useful diagram which explains the concepts well. For example, In the diagram above, you can see that when a number of elements increases, linear search becomes slower and slower but a binary search doesn't. For example, for 4 billion items binary search just takes 32 guesses as opposed to 4 billion guesses required by linear search. The algorithm is implemented recursively. Also, an interesting facto to know about binary search implementation in Java is that Joshua Bloch, author of the famous Effective Java book wrote the binary search in "java.util.Arrays". 1333 is not present in the list. That's all about how to implement binary search algorithms in Java without recursion. Like any recursive algorithm, this code doesn't use any loop like a while, for, or do-while loop.